Long before you own a car, you likely heard about the need to rotate your tires. It’s one of those things, like changing the oil, that just comes with vehicle ownership. But, is it really worth it? Why? How often should you have it done? To answer this, and more, we asked a Master Mechanic! Almost every vehicle and tire manufacturer will recommend regularly rotating your tires to help make sure they wear evenly over time. 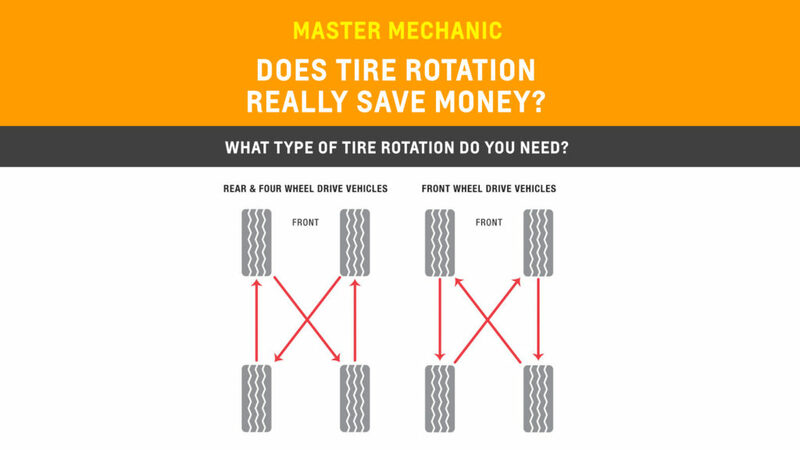 That said, tire rotation is one of the most neglected maintenance items we encounter at Master Mechanic! It’s not hard to spot, either. Front tires with more wear or accumulated brake dust usually indicate that a tire rotation is overdue. The accumulated brake dust or rust on wheels is because your vehicle’s front brake do 80% of the work. Although today’s cars are mostly front-wheel drive or four-wheel drive systems that primarily use front-wheel drive, all cars benefit from a tire rotation. When you consider the weight of the engine, the force they endure when braking, and the toll of constant turning, it’s easy to understand why front tires experience substantially more wear than the rear tires do. Over time, when select tires are under more strain from a heavier workload, they wear more quickly. The solution? Rotate your tires! When you do this, the tires wear evenly which helps to extend their life. Fewer tire changes over the life of your car can equal serious savings. For the low cost to rotate your tires and the money it saves you in the long-term, it just makes sense. What if you don’t rotate your tires? Simply stated, your vehicle’s tires won’t last as long as they should. Ensuring even tire wear is critical to vehicles equipped with all wheel-drive as their systems require consistent tire diameters between the 4 wheels. Excessive differences in tire diameters can cause issues with drive system components and possible issues with the ABS braking system. When it comes to your tires, being proactive goes a long way. It’s important to remember that rotating your tires is just one part of tire care, which includes proper inflation, balance, and correct wheel alignment–all services offered at your local Master Mechanic. Rotating your tires is not like playing musical chairs. There’s a method to the madness. In fact, there’s a specific way to rotate tires on front, rear, and four-wheel drive vehicles. Consult your vehicle owner’s manual for the recommended procedure for your vehicle. You’ll hear so many different opinions when it comes to how often you should rotate your tires. The most important thing is that you do it! Once again, look at your owner’s manual. All manufacturers offer guidelines for each specific make and model. At Master Mechanic, we recommend rotating your tires every 10, 000 km, which we typically complete with every other oil change. All cars and drivers are different, though, and we’ll always advise you if you require a more or less frequent rotation schedule. Ready to rotate your tires? Book an appointment today at your local Master Mechanic!